A creative and comprehensive collection of church activities to engage people of all ages across generations and cultures. From seasonal worship services to holiday-centered celebrations, each activity in this practical program book includes time for worship, fellowship, and faith development. Features sidebars with even more holidays or themes to celebrate. Also includes material for a weeklong Dr. Seuss-themed VBS!The book also directs readers to a related website offering additional free programs and resources! 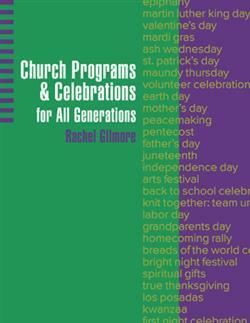 View the Rachel's webinar "Engaging All Ages with Church Programs & Celebrations," and listen to her podcast on the topic of intergenerational church programming. Rachel Gilmore, MEd, has twenty years experience working in nonprofit settings in the areas of Christian education and youth ministry (including retreat ministry), as well as volunteer management, program/event planning and facilitation, and public relations. A prolific writer, Rachel writes for Christianity Today's SmallGroups.com website and previously wrote a weekly column titled "Intersections...of Faith and Life" on frankfort.patch.com. She has had more than 200 articles published in local newspapers and national magazines such as Chicago Parent, Christian Parenting Today, DevoZine, Leader in the Church Today, Church Educator and Group magazine. She is a contributor to Best of Try This One: Most Popular Ideas from the #1 Youth Ministry Resource and Plugging in Parents: 200 Ways to Involve Parents in Youth Ministry, both from Group Publishing. In 2012, her story "Gracefully Grateful" will appear in The Magic of Mothers and Daughters, a new edition of the Chicken Soup for the Soul series.